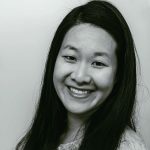 Published Oct 1, 2017 By Julia 23 CommentsThis post may contain affiliate links. Here’s a delicious and healthy cold shrimp salad with avocado, tomatoes, feta cheese, and lemon juice. 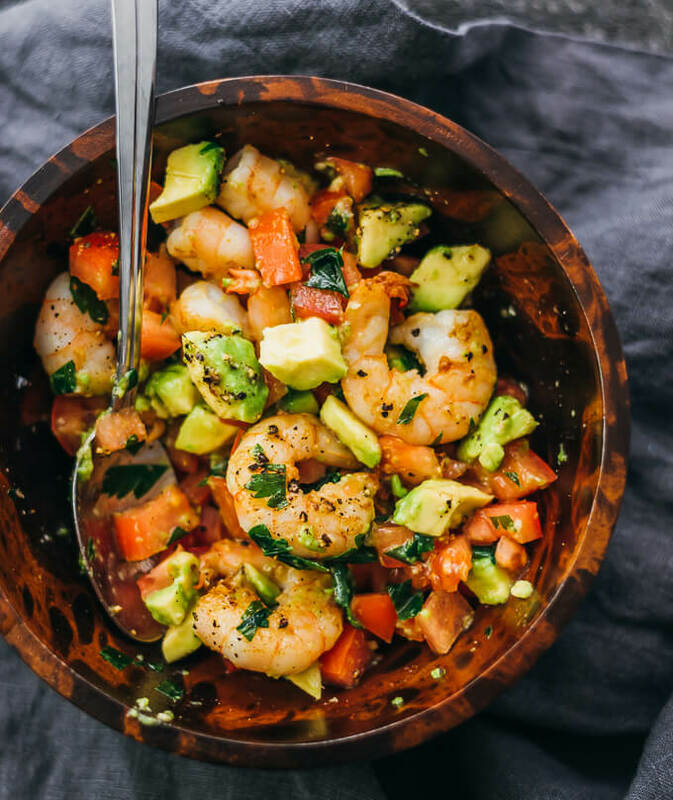 Summer might officially be over, but that doesn’t mean you can’t pretend it’s still here by having an early autumn cookout and making this shrimp avocado salad as a side dish. 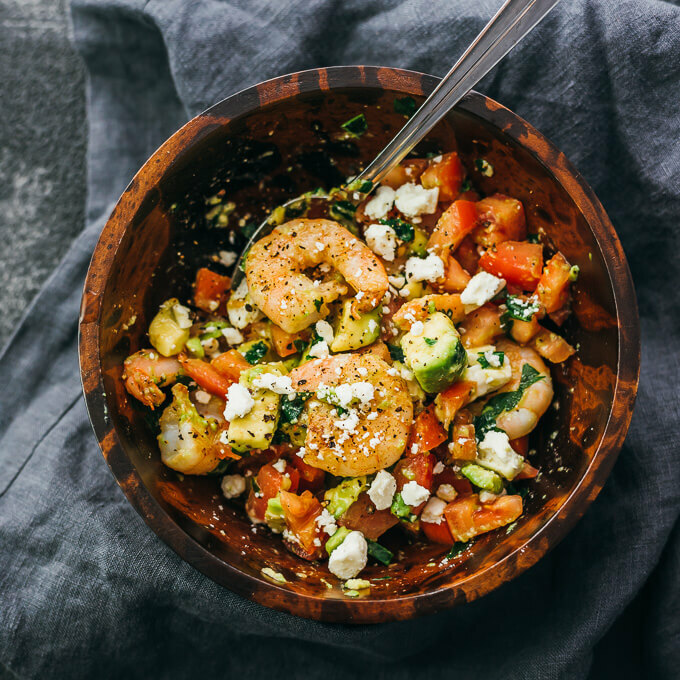 You’ll love all of the flavors and textures in this salad, with ripe avocado chunks, seared shrimp, chopped cilantro leaves, fresh tomatoes, and crumbled feta cheese. This is a fairly simple recipe, and only takes around 5 minutes for cooking the shrimp plus 15 minutes for prepping and tossing the salad together. It’s also very refreshing in taste and healthy to boot — low in carbs, packed with good fats, with plenty of protein and vitamins. You can cook the shrimp a number of different ways — pan searing, boiling, or grilling. 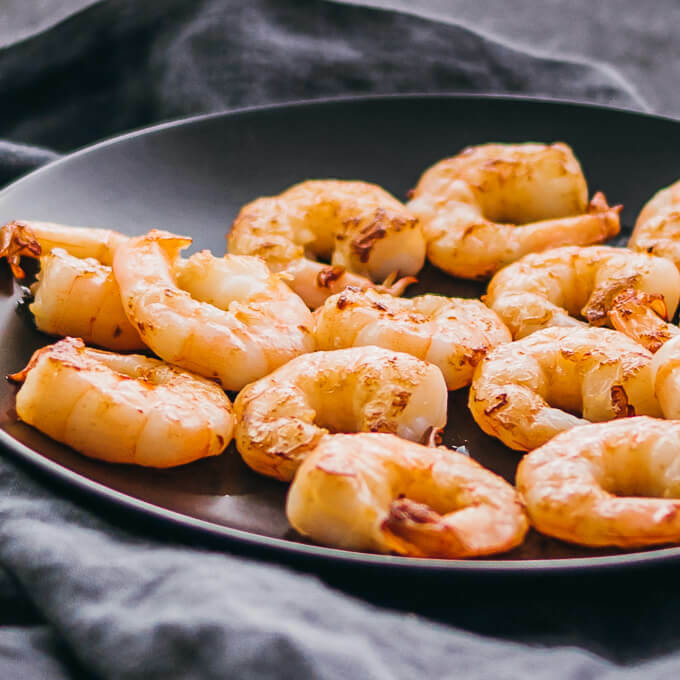 I prefer the taste and flavor of pan seared shrimp in butter over boiled shrimp, and I find pan searing to be the easiest option. Any method of cooking will work here, as long as you cool the shrimp before mixing them with the rest of the salad fixings. If you love pan seared shrimp, you should also make my pan seared shrimp with tomatoes and garlic. The sauce is delicious and goes great with zucchini noodles and vegetable sides. Fresh or frozen shrimp will work here. If using the frozen variety, let thaw before cooking by defrosting in the refrigerator overnight or running the shrimp under cold tap water. This recipe makes a small amount of food — just 2 servings as a side salad. It’s perfect as an appetizer or a small meal for two people. 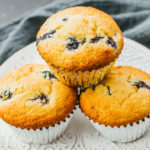 If you’re looking to serve a larger crowd, you can simply double or multiply the ingredient amounts accordingly and follow the recipe instructions as usual. Depending on the amount of shrimp you have and the size of your pan, you might need to pan sear them in batches. 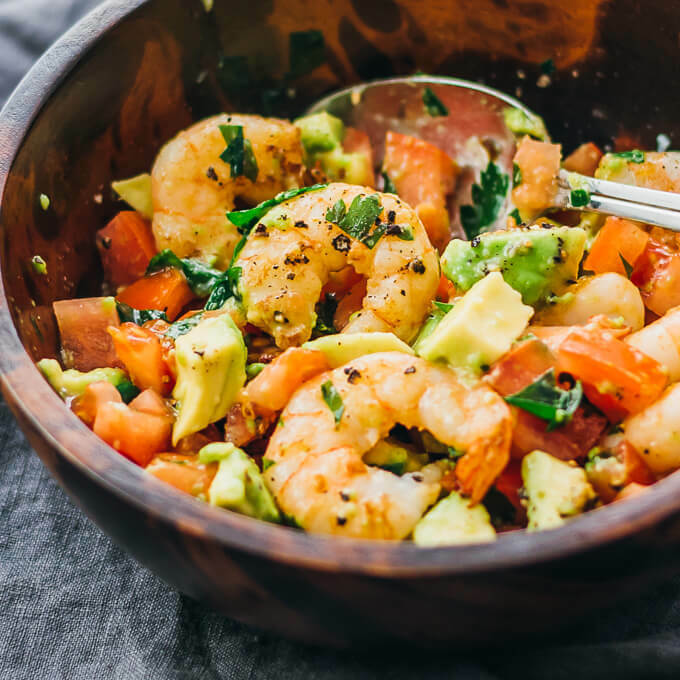 You can make this shrimp avocado salad ahead of time — just refrigerate until ready to serve. Make sure the tomatoes are well-drained before adding to the salad so that you don’t end up with a pool of tomato liquid at the bottom of the salad. A delicious and healthy cold shrimp salad with avocado, tomatoes, feta cheese, and lemon juice. Heat a pan over medium-high heat for a few minutes until hot. Add shrimp to the pan in a single layer, searing for a minute or until it starts to become pink around the edges, then flip and cook until shrimp are cooked through, less than a minute. Transfer the shrimp to a plate as they finish cooking. Let them cool while you prepare the other ingredients. 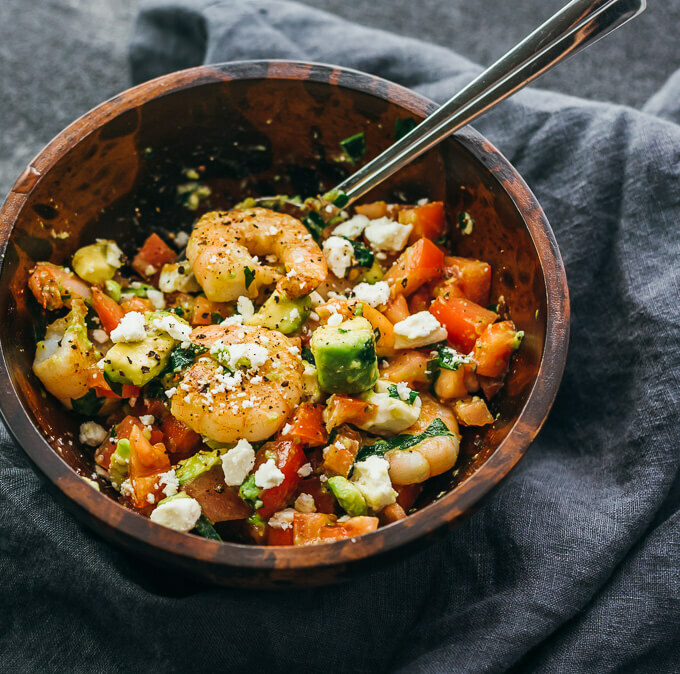 Add all other ingredients to a large mixing bowl -- diced avocado, diced tomato, feta cheese, cilantro, lemon juice, olive oil, salt, and pepper -- and toss to mix. Add shrimp and stir to mix together. Add additional salt and pepper to taste. how much would be considered one serving? A cup? two cups? This was sooooo yummy. I doubled it and added red onion. Awesome recipe! My husband loves shrimp. Thanks for participating in Keen for Keto’s salad recipe roundup, Julia! 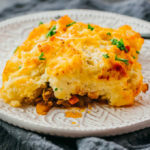 We made this for dinner last night and it was amazing! We added cucumber and I think next time I will try a little shallots or purple onion in it for a little crunch. Thank you for such a low carb meal. Cucumber is a great idea! Hope you guys get to make this again soon. If you were to make this and keep it overnight, will the avocado keep?? Usually avocado doesn’t keep its green color overnight. Maybe you can prep everything except the avocado, and chop it up right before serving? My husband and I had this for dinner tonight and we both cleaned out plates. This was so simple to make so we will be enjoying this again. 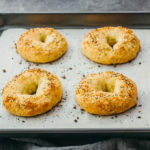 Absolutely delicious and super easy! I omitted the additional salt because the feta was salty enough for me. Will be making this again! Can this be made as a meal prep for a work lunch? Hi Ursala, I think that would work great! You can make everything ahead of time and store in covered lunch containers. Made this for my dinner tonight and really liked it. I did add dried figs that I reconstituted in warm white wine, and cut them in half. I also used lime juice instead of the lemon juice cause I like it better. I am amazed how filling this dish is! Is there anything I can use in replace of feta cheese? How about blue cheese or shaved parmesan cheese? Can you make extra for a few lunches? Yes! This only makes a small amount, so you can triple the amount for a larger meal or for the next day. I’m sorry to hear you are sick. Prayers will be sent tonight with your recovery in mind. Stay strong!